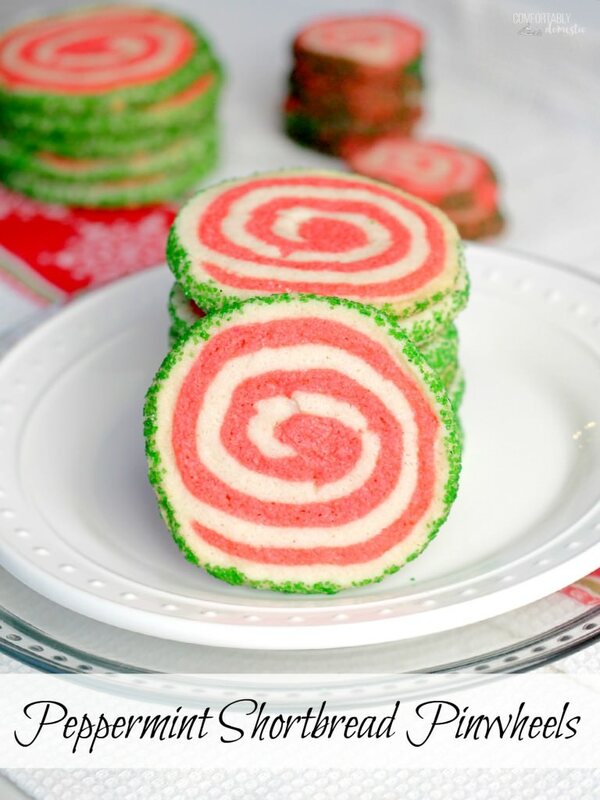 Peppermint shortbread pinwheel cookies are the perfect cookie recipe to make for your holiday cookie platter! Buttery vanilla and peppermint shortbread, presented in a fun pinwheel design. Edged in colored sugar, for an added touch of holiday sparkle. Every year I make the usual round up of Christmas cookies for the holidays. We always make shortbread cutout cookies to decorate–usually in very non-traditional shapes such as helicopters, horses, elephants, and the like because that’s just how we roll. Chocolate Jam Thumbprints are another given because I just love the cheery spot of jam against the dark background and crinkle tops. It’s just not Christmas unless I make the spiced Pfeffernusse Cookies because the cookies themselves remind me of my aunt Jane, and the traditional recipe reminds me of my sweet grandma. I always save a spot or two on the cookie platter so that I can try a new recipe, or as in this case, tweak another great cookie recipe to suit the holidays. This year I decided to alter the recipe for the chocolate and vanilla swirled Happiness Cookies to reflect the visions of sugar plums and peppermints of the season. I figured that I’d flavor half of the dough with peppermint and color it a festive red for the season, rather than the usual chocolate. Then I thought that I’d roll pieces of the vanilla and peppermint doughs into long ropes, twist them into candy cane shapes, and will therefore have baked the cutest Christmas cookies in the land! My plan was going swimmingly, right up until the part where my shortbread decided that it didn’t especially feel like being rolled into ropes. So I kept trying with various temperatures of dough–from room temperature to well chilled–with little success. Then my stubborn self kicked in, trying to force the little suckers to stay together, because my vision of peppermint shortbread ropes would not be thwarted! There was much throwing around of cookie dough and flour. Maybe a teensy bit of swearing…in my head. I contemplated tossing the whole affair into the trash and not making any Christmas cookies at all. I further contemplated moving to a remote village, where ovens and cookies ceased to exist, because the catastrophe had me questioning my faith in all of humanity. Then I remembered that butter, flour, and sugar are my BFF. Also, that I really like people. Instead, I re-wrapped the dough and let it chill out in the ‘fridge for a few hours, while I binge-watched cheesy Christmas movies on Netflix. Three movies and one ridiculously huge bowl of ice cream brought about the epiphany to just make pinwheel cookies because they’re every bit as festive as candy canes. Right? Right?! So here I am, all jacked up on sugar and cinematic holiday cheer, sharing the peppermint shortbread pinwheel cookies recipe that restored my faith in baking and humanity. Because who wants stinkin’ candy cane cookies anyway? 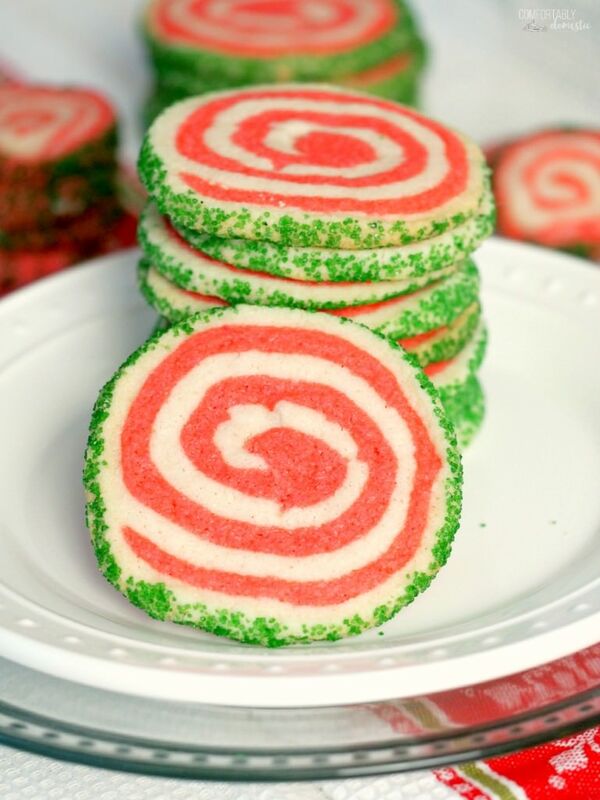 Buttery vanilla swirled with refreshing peppermint shortbread cookies presented in a fun pinwheel design edged in colored sugar for an added touch of sparkle for the holidays. Cream the butter and sugar together in a large mixing bowl until it looks creamy, and has lightened a bit in color. Stir in the vanilla extract until fully incorporated. Whisk the salt into the flour. Add the flour mixture to the butter mixture in 2-3 batches, mixing well in between, until the dough comes together. Lay two large pieces of plastic wrap on a clean, flat surface. Dump the dough onto one of the sheets of plastic wrap. Form the dough into a ball and divide it in half. Press one half of the dough into a rectangle about 1/4-inch thick. Wrap that half of dough well with the plastic wrap. Place the other half of dough back into the mixing bowl. 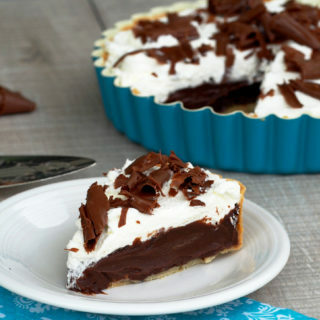 Beat in the peppermint extract and food coloring until well incorporate. Flatten the peppermint half of dough into a large rectangle that is the roughly the same size as the vanilla half and is also about 1/4-inch thick. Chill both halves of the dough in the refrigerator for 30 minutes. Unwrap one of the chilled vanilla dough rectangle. Roll it out on a floured surface into a rectangle that’s about 9” x 14” until it’s just under 1/4 -inch thick. Unwrap the peppermint dough rectangle. Roll it out on a large piece of floured parchment paper until it takes the shape of a large rectangle that’s about 9” x 14” until it’s just under 1/4 -inch thick. Starting with the long edge farthest away, begin to tightly roll the layers toward you—jelly or cinnamon roll style—to form a large, tight log. Wrap the log in plastic wrap and refrigerate for 20 minutes to firm it up a bit. Once the log is very firm, remove one from the refrigerator. Unwrap the cookie dough log and place it on a large cutting board. Take a minute to preheat oven to 350 degrees, as well as line several baking sheets with parchment paper or silicone baking mats in order. Use a serrated bread knife to slice the log into 1/4 -inch thick pinwheel rounds. Place the pinwheels 2-inches apart onto the prepared baking sheets. Hold any pinwheels not currently being baked wrapped in the refrigerator. Bake the pinwheels for 12 to 14 minutes or until set but not browned. Allow the cookies to rest on the baking sheets for 3 minutes before transferring them to a wire rack to cool completely. Store cooled cookies in an airtight container at room temperature for up to one week. This cookie dough freezes beautifully! Simply double wrap the sprinkle encrusted cookie dough logs in plastic wrap, and then again in aluminum foil. Dough may be frozen for up to a month. To bake, thaw the logs overnight in the refrigerator, and then slice and bake the following day. These are gorgeous. I've made pinwheels and also checkerboard cookies before. SO I feel your pain. Not as easy task. 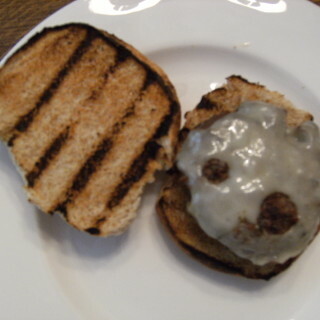 Yours turned out great though. I could eat these all day long. I love shortbread cookies and the addition of peppermint extract sounds fantastic! These look so pretty and colorful!